The 2015 Building on Faith house was built in partnership with Lindsey, a single mother of two medically fragile boys. Building on Faith 2015 kicked off May 16 and the home was dedicated on August 29. Lindsey and her family were settled in by mid September. my two boys and I to have a safe and beautiful home. Lindsey and her two medically challenged boys were living in the master bedroom of her parents’ house when Lindsey discovered Habitat for Humanity. 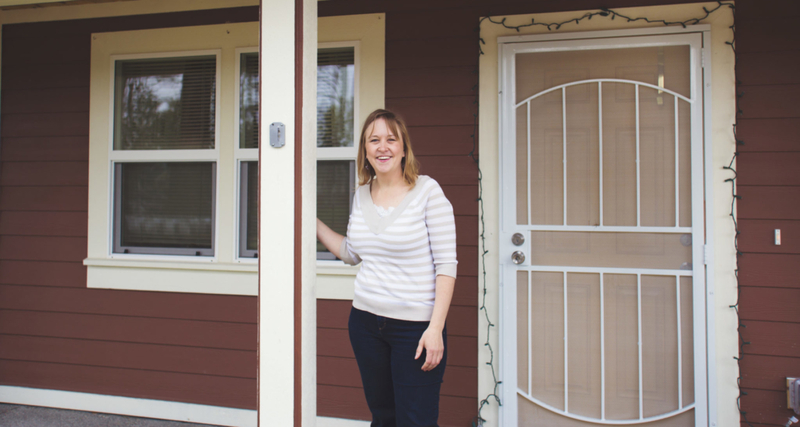 It was Lindsey’s trust in God that led her to take the first step toward homeownership with Habitat. Faced with the fact that both of her boys will likely not reach full adult height, and that her younger son may eventually be wheelchair-bound, Lindsey was overwhelmed that her Habitat home was built wheelchair-accessible and to ADA standards. Lindsey and her sons moved into their Habitat home in the fall of 2015, and the boys immediately started school. Since then, Lindsey has given back to the neighborhood she calls home, serving on the board of directors of the homeowners association, sharing her story with numerous volunteer groups, and speaking as an advocate for affordable housing.